When it comes to ESXi host patching, I am a big fan of VMware Update Manager as it makes the upgrade process flawless. Using VUM, you just need to create upgrade baseline, download patches then attach baseline to host and finally stage/remediate the patches then update manger will initiate the patch installation and reboot the host once done. Now coming to the point, we had few ESXi 5.0 hosts and wanted to upgrade them to ESXi5.1 update3 so I thought of upgrading them using VUM instead of command line. 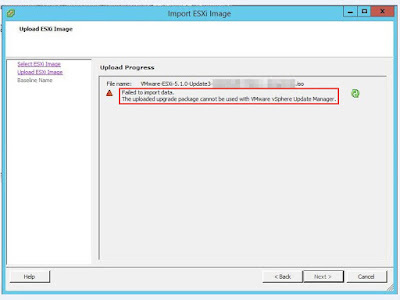 "Failed to import data, The uploaded upgrade package cannot be used with VMware vSphere Update Manager"
I was aware about the fact that one need to upgrade the version of VUM before importing a newer image to update manager repository as the minimum version of VUM required should match the version of the ESXi image you are trying to import but here I was trying to upload ESXi5.1 image to VMware Upgrade Manager 5.5 and unable to do so. 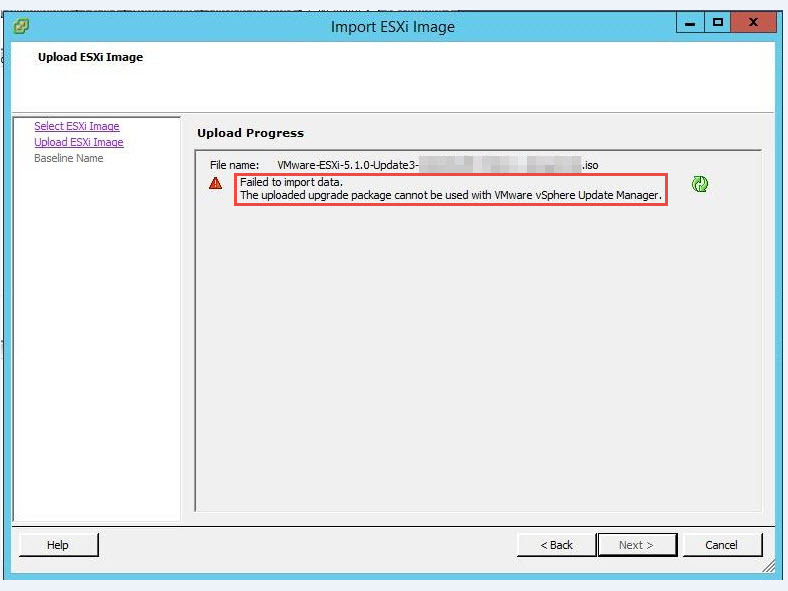 I tried with different ESXi5.1 images like Cisco or HP’s customized images as well as standard VMware ESXi5.1 image but the end result was same however when tried to import ESXi5.5 image to VUM, was able import it without any issue. Later I checked with VMware support about this and they also confirmed the same.